Non-U.S. Government sales are subject to U.S. Government approval. Based on a USD price of $6,985.00 and today's exchange rate. VesseLINK utilizing Iridium CertusSM gives your critical marine operation global communications coverage. It is the communications solution to depend on for essential communications whenever and wherever you are at sea. VesseLINK utilizing Iridium CertusSM gives your critical marine operation global communications coverage. It is the communications solution to depend on for essential communications whenever and wherever you are at sea. Whether you operate a large fleet or a single vessel, this commercialized, military-grade solution is designed to meet your unique challenges through a simple, adaptable and robust design. 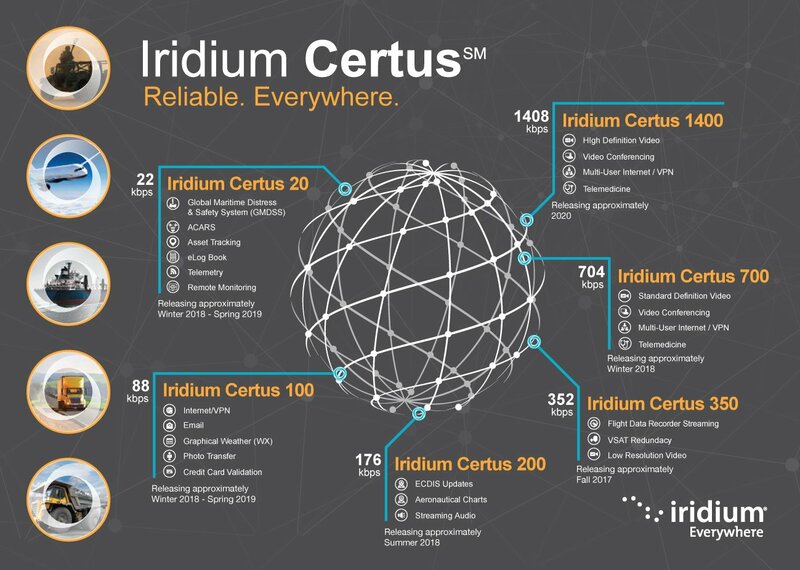 VesseLINK on Iridium operates using Iridium CertusSM broadband services over a network of 66 satellites that cover 100% of the globe, including deep oceans and the poles. The solution utilizes this robust network service to provide highly reliable, mobile and essential voice, text and web communications. Thales unveiled its terminal and VesseLink service that will use Iridium Certus. VesseLink includes a high-gain electronic phased array antenna that weighs 3.2kg and a below-deck unit. Thales VesseLink will enable data streaming up to 256 kbps and IP data sessions up to 700 kbps downlink and 352 kbps uplink. Thales head of maritime Robert Squire said it will have 10 times the throughput of existing Iridium services. “It will be lightweight, easy to install and have only one cable between the antenna and the below-deck unit,” he added. Additional features include pairing to 4G services, embedded WiFi access, an optional handset, and Android and iOS support functionality. Testing is about to begin at Thales’ Maryland, USA offices. The terminal will then be tested at sea during the rest of this year, said Thales director of sales for satellite communications solutions Brian Aziz. Initially VesseLink will operate at around 350 kbps, but Mr Aziz expects speeds of 700 kbps to be available early in 2019. “Our antenna is solid-state, electronically-steered and will constantly have a link to an overhead satellite. The terminal will have three Ethernet ports, dynamic switching and cellular connections.” It will have WiFi, public exchange for inter-vessel communications and an associated Android-enabled handset.